Ty Tashiro (@tytashiro) is an author and relationship expert. He wrote Awkward: The Science of Why We're Socially Awkward and Why That's Awesome and The Science of Happily Ever After. His work has been featured at the New York Times, Time.com, The Atlantic.com, NPR, Sirius XM Stars radio, and VICE. He received his Ph.D. in Psychology from the University of Minnesota, has been an award-winning professor at the University of Maryland and University of Colorado, and has addressed TED@NYC, Harvard Business School, MIT's Media Lab, and the American Psychological Association. Click to display or to hide the script from Episode 57. John Bailer : Today we're going to be talking about social relationships and the awkwardness and how you interact with others, and how the way you're "hard-wired" may relate to the way you encounter others. 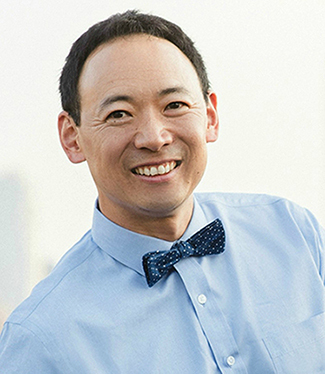 We're going to be talking today with Psychologist and Interpersonal Relationship Expert, Ty Tashiro. He's going to help us understand the research and Neuroscience and Sociology to think about this trait of awkwardness, and its origin. We certainly enjoy it on the television shows like "Big Bang Theory", and celebrate that in many of our Home Departments, as those of us around the table might confess to. I'm John Bailer, I'm Chair of the Department of Statistics at Miami University, and I'm going to be leading in to this discussion on Stats & Short Stories today. Joining me in the studio are Richard Campbell and Rosemary Pennington. Our special guest today is going to be Ty Tashiro, as I mentioned, who is an author and relationship expert. He received his PhD. In psychology from the University of Minnesota, and is the author of "Awkward: The Science of Why We're Socially Awkward, and Why That's Awesome". Ty, welcome. And, how did you get involved in studying this phenomenon. Ty Tashiro : Well, there are a number of factors, I guess. When I was a kid, I was a very socially awkward kid. So, I have some history with the topic I guess. It was about three years ago that I had a bunch of friends who had happened to move to new cities right about the same time. And, some of those friends are socially awkward, and they're great, fantastic people, but, when I would go to visit I would see them struggle as they tried to meet new people, and watched how their awkwardness was tripping them up in their attempt to make new social relationships. And I had this thought to myself which was, "You know, if they could just skip the first five minutes of these social interactions, I think they'd be a lot better off!". Because they're great people you know? With amazing character and kind hearts and so interesting, and I thought, "well somebody must have researched this", and then too, somebody must have written a book about this. So, what I found out was that there was a lot of research that was relevant to social awkwardness. In the end, there were over a thousand studies that were relevant to social awkwardness, but nobody was really taking this research and given it to the broader public, to talk about why we're awkward and why it might be helpful to think about in terms of potential upside to being socially awkward. Rosemary Pennington : I'm one of those people who the first five minutes of any social interaction where I don't know you is a nightmare and I can't breathe and I don't know what to do. So, what advice would you give to me and others who want to be able to connect but can't seem to jump that hurdle easily? Tashiro: Yeah, I know the feeling. And it can feel like everything is accelerated during those initial minutes. And, someone who is really smart and really competent in other areas of their life feel like, "gosh, I just don't know what to do in these situations". I think one of the things that awkward people do really well, is they're really good at seeing systems and methods. And you even see this professionally. Socially awkward people are much more likely to go into professions like Science, for example, where they use the Scientific Method. Maybe something like Mathematics where there's rules of Mathematics. Even creative things like Ballet, where there's methods to how you get better. Now, in social situations, I think that awkward people can learn the "rules of engagement", because most of our social interactions are kind of like Groundhog Day, right? They're repeated over and over again. We say "Hi" in the same way, as we get asked the same questions, we're supposed to do the same "Social Graces". And so, a lot of awkward people benefit from studying manners, because manners are a "Playbook", of sorts, for how you handle these early moments within an interaction. There's ample resources on the internet, also in books. And just studying these things and figuring out how to implement that in a way works for you can allow these things to become routines that people become expert at, and then that starts to become automatic, and then that liberates people to let their personalities to show through. Richard Campbell: I read in some place that you said "awkward people tend not to look people in the eyes when they first meet. They look at their ears or their chin". So, would you advise… you know, is that one of those things that you would study, like "practice manners is looking people in the eye when you talk to them initially"? Tashiro: That's yeah, that's a great example. Of course, the chin and the ears are not as information-rich. Campbell: I love how you said that, "it's not information-rich to look at somebody's ear". Tashiro: Just like a true researcher. So right away the awkward person is behind, right, because they're not getting cues everybody else would be getting that are important for reading the other person's emotional state or their intent. So, yeah, you want to look in the eyes for pragmatic reasons to gather information, but also because it makes people feel uncomfortable when eye contact is perceived to be erratic. Here's a place where science can help us out a little bit. There's people who have used eye tracking technologies to study. How long is the appropriate time to look somebody in the eye? It turns out it's 3.2 seconds. And you break away, and then 3.2 back on. Bailer: Well, now we're going to start timing ourselves. Bailer : So, what has changed for you and your friends as a result of a review of all of this literature? Tashiro: Well, I've heard from a lot of people, some of them friends, some of them just folks who have read the book, and I'm always grateful to hear from people. And I think the thing that warms my heart is one, to hear folks say, "it's so nice to hear that I'm not alone in the world". And it turns out that about 15% of people are socially awkward, so, you know, awkwardness is not some kind of weird outlier kind of condition. It's actually pretty common. It's nice to hear from people that as they probably intuited, but their character and their values as a person isn't connected to their social skill and short-term interactions, or their charisma. And there's an upside to social awkwardness too, in which that social awkwardness is strongly correlated with giftedness and extraordinary achievement. Sometimes what psychologists call: striking achievements. Meaning that you're really excellent in a particular area, and so this great focus that awkward people have, this ability to get really interested and enthusiastic about some particular topic kind of drives a willingness to persist and to have the grit to get really, really good at something. So, I think that it's important for awkward people to realize that their unusual interests are okay. And the amount of enthusiasm and love that they have for it is not only okay, but just a great thing that I think most people would like to experience. Bailer: Great message, great point. It's been our pleasure to have Ty Tashiro to join us on Stats & Short Stories. Stats & Stories is a partnership between Miami University Departments of Statistics and Media, Journalism and Film, and the American Statistical Association. Stay tuned and keep following us on Twitter or on Apple Podcasts. If you'd like to share your thoughts on our program send your email to statsandstories@miamioh.edu . And be sure to listen for future episodes where we discuss the statistics behind the stories and the stories behind the statistics.